Women have been parked in the background here, mentioned second hand in conversation, as if in battleground despatches, seen across a room. There is only one mama in this yarn and that is Hanya Yanagihara herself, not in person but moving her boys around. In the context of the Man Booker long list it might just seem like the entry for Hawaii – see my notes here on some of the others – but that would be a book jacket error. This is educated, intelligent, professional, immigrant USA, the corners of respectable society many writers rarely go near, heavily and handsomely informed on, not least, academia, art and law. This is a world of “grants and residences and fellowships and awards“. Yanagihara loves her characters. She has a driven sense of curiosity about them. She takes her time etching out their troubles, mysteries and motivations, unravelling them little by little as if each one is a cocoon, coaxing them into situations, into reminiscences. We have this disparate band of housemates/collegemates bound by their scholarship and ambitions, a Friends for 2015, or more precisely Friendships of which there is some eloquent interplay. One says: “I enjoyed hearing him think”. A level intelligence crackles through the prose and dialogues. She uses a clever device of narrating in the first person irrespective of who is talking so you have to stay alert. So far so good, even brilliant, but then there is a change of mood and the plot sort of rolls over to reveal its dark underbelly of success and slowly we are in a world where Yanagihara is less comfortable. Transparently she does not really know so well issues like taking crystal meths, self harming, abuse in different guises (especially male). Exposition is replaced by straight description, laid on thicker and thicker. She has set up marvelously (among others) the New York attorney with issues, the shark in the courtroom, sometimes even Perry Mason style, in a wheelchair. But to use an analogy that avoids giving too much away, her Perry Mason is more intersted in his own self pity, his own self abuse, his own relationships than the drama of the cases which he admits are his escape and salvation. The focus is the dark hours of the night not the clear sunshine of the morning. And ultimately we have two books bolted untidily onto each other – one might have been an investigation of the other but effectively they inhabit different universes and have very little to say to each other. Yanagihara is also a woman writing about boys/men. She disrobes their masculinity helped in part by one of her characters, Jude, the obscure for sure, who is male but perhaps pansexual, necessarily non-sexual. But having no women around, slowly the boys get subjugated into assuming her female concerns and behaviour and we get gender confusion, even though any of the main characters could as easily have just been more believable as, well, just women. 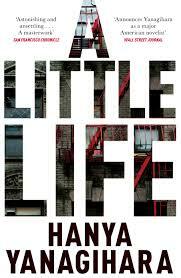 A Little Life might have been a masterpiece as A Little Book but at 720 pages it is also carrying a lot of cellulite. This entry was posted in 101greatreads, fiction and tagged A Little Life, child abuse, Hanya Yanagihara, Hawaii writer, Man Booker long list, paedophilia, self harming. Bookmark the permalink. I agree that it could have been shorter but I really enjoyed the timelessness of the story which I thought was very effective.